Please check back as more information is always added. Don't forget to ask the Librarian for assistance in research. Visit the EPQ Frog site for more information as well. 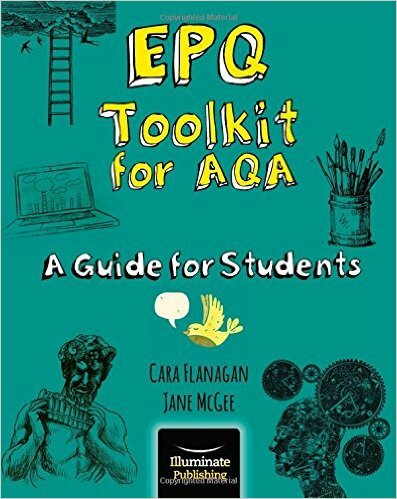 The EPQ Toolkit for AQA is a highly practical, colourful, magazine-style guide that provides support, advice and guidance for carrying out your independent extended project work. It will support you through your whole EPQ journey, from helping you to choose your project to planning, developing and executing both the production log and the final product. Numerous exemplars of student projects help illustrate good and bad practice helping you to improve your final mark. An EPQ Moderator provides invaluable hints, tips and advice throughout giving you the confidence you need to work independently and succeed with your project. This book will be made available from the Library on a 7 day loan. JURN is a unique search tool, helping you to find free academic articles and books. It harnesses all the power of Google, but focuses your search through a hand-crafted and curated index and also covers selected university full-text repositories and many additional ejournals in science, biomedical, business, law and aspects of the natural world. Zotero is a free, easy-to-use tool to help you collect, organize, cite, and share research. You can download this software free from the link below to help you with your research. Online resources from West Sussex public libraries – you need a library card to access most of them, but it’s free to join and will give you access to books in libraries across the county too. Directory of Open Access Journals - DOAJ is a community-curated online directory that indexes and provides access to high quality, open access, peer-reviewed journals. A comprehensive guide to search engines to help your research get off to the best possible start. Don’t just go straight to Google! Open University guide to planning and doing your research. Well worth spending some time on before you start. Social bookmarking site – copy and save links, rate and share them. Really good practice to get into. Useful study tips including how to block distracting sites like facebook etc! Information about copyright law which may be relevant to your research or any artefact you produce.